Enjoy gracious hospitality and exceptional service at this three-diamond AAA-rated Baltimore hotel. 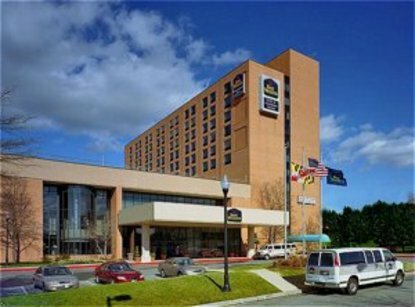 The Best Western Hotel & Conference Center provides comfortable accommodations for business and leisure travelers to Baltimore. Ideally located just minutes away from the downtown Inner Harbor area. Hotel guests will enjoy comfort and convenience, with easy access to Interstate 95, Oriole Park, Raven's Stadium, John's Hopkins Hospital, University of Maryland Medical Center and Baltimore-Washington International Airport. In addition to free parking for the duration of your stay, we are pleased to offer our guests a complimentary hotel shuttle with scheduled runs to the inner harbor and Johns Hopkins Hospitals. Located on the mezzanine level in the hotel, Toby's Dinner Theatre of Baltimore offers an unforgettable evening of music and magic. Deliciously entertaining Each spacious, well-appointed room is fully equipped with complimentary high-speed Internet access, cable television, ample desk space, coffee/tea maker and iron/ironing board. Every morning guests to this Maryland area hotel are greeted with a complimentary breakfast including a Belgian waffle station, sausage, eggs, and free newspaper. After a busy day, visitors to this hotel can enjoy a dip in our indoor pool or workout in the newly renovated fitness center. Business travelers will especially appreciate the business center and spacious meeting facilities. A well-trained staff is ready to implement events upon request. Come experience the hospitality and professional service at the Best Western Hotel & Conference Center in Baltimore, Maryland.